Learn about the various staff development schemes and programmes. Scheme provides scholarships to the faculty who fulfils eligibility criteria and obtains admission in the Doctoral Degree programme leading to award of PhD degree in any of the enlisted top 500 universities/institutes (based on the QS ranking, the Times ranking and the Shanghai ranking) in the world. AICTE and INAE distinguished visiting Professor scheme envisages promotion of industry-institute interaction. The objective is to conduct AICTE-ISTE Induction/ Refresher Programmes for the teaching faculty working in technical institutions. Total 100 Refresher programme & 50 Orientation programme with the funding of Rs. 300000 per programme. 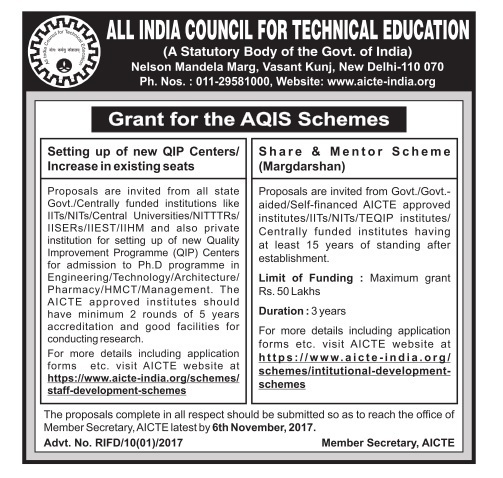 To promote use of 'Scheduled Regional Language' in Technical Education for creating knowledge base in local language and to encourage creation of treasure of latest technical knowledge incorporating the newest developments by grant of financial support to the distinguished faculty/writers/translators. Short Term Training Program (STTP) intends to conduct faculty trainings through financial assistance from AICTE to enable faculty members in the field of technical education to introspect and learn techniques that can help prepare students for active and successful participants in a knowledge society. The Emeritus Professor (Distinguished Practicing Engineer) Fellowship intends to utilize the expertise of highly qualified and experienced superannuated Engineers who have made undoubtable, unchallengeable, unparalleled and exceptional contribution to the society in their respective fields in any discipline in engineering for the benefit of students/faculty of host institutes & of institutes located in the adjoining areas.